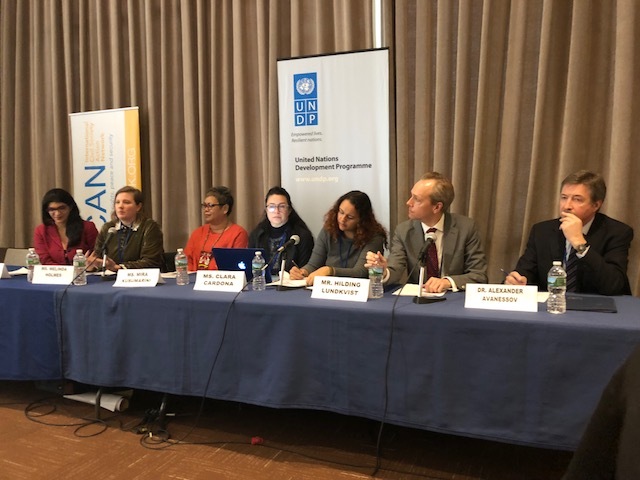 On March 19th, ICAN, the Swedish Mission to the UN, and UNDP hosted “Gendered Dimensions of Return, Rehabilitation and Reintegration from Violent Extremism: The State of Programming and Policy for Women and Girls”. The discussion highlighted the importance of taking into account the gender aspects of this kind of work so that we can be successful in our efforts on preventing violent extremism, emphasized by Mr. Alexander Avanessov, Special Advisor on Prevention of Violent Extremism with the Bureau of Program and Policy Support at UNDP. He asserted that research such as that being undertaken by ICAN and UNDP is key to be able to fully understand the situation on the ground and fill the gap in programs designed specifically for women and girls. Mr. Hilding Lundkvist, representative of the Swedish Mission to the UN, added that although we are making headway in other sectors, when it comes to terrorism and violent extremism, there are gaps in our policies and approaches that need to be filled. To date these gaps are largely being filled by women-led civil society organizations, who face serious risks to their legal, physical, and financial security given the grey area that is policy on engagement with returnees and their families, Ms. Melinda Holmes, ICAN’s Senior Advisor and Program Manager said. This is not new. Ms. Clara Cardona of CIASE (Corporación de Investigación y Acción Social y Económica), described what they have learned from the approach to women and girls in the disarmament, demobilization and reintegration (DDR) processes that have been underway in Colombia since the 1990s. When they began doing this type of work the only people who were willing to speak with demobilized women were feminist organizations, she said. While the DDR process in Colombia included women and girls, it did not account for their different experience of the conflict, it did not provide the opportunity for them to be part of the political process, and it failed to protect them from further sexual and gender-based violence during reintegration. In contrast, women and children affiliated with violent extremist groups are often either excluded from prosecution and incarceration through which any government-led rehabilitation and reintegration takes place, or they are completely under the radar of the state. In this they pose a challenge to receiving communities that local civil society refuses to ignore, seeking to meet their humanitarian needs, address trauma and stigma, and ensure the preservation of peace and social cohesion. In Indonesia, Ms. Mira Kusmarini, Executive Director of Civil Society Against Violent Extremism (C-SAVE), said they were forced to adopt a gendered approach because 70% of people returning are women and children. C-SAVE has worked with the government to create standard operating procedures for dealing with women and children on return and during rehabilitation, in an attempt to address the gap in capacity. The majority of those returning were detained and deported back before reaching Syria or Iraq. Their ideological transformation poses a tougher challenge than those who made it, as their hopes to join the group remain, Ms. Kusumarini has found. In addition, women are more hardened ideologically and less likely to accept the terms of rehabilitation and reintegration programming, namely explicitly accepting the Indonesian state, than men. We cannot look at women as a homogenous group; not all join for the same reasons and not all are joining extremist groups willingly, said Ambassador May-Elin Stener from the Permanent Mission of Norway to the UN. She went on to note that women are influential peacemakers, yet the gender dimension is usually overlooked. For example, although Norway has created a national action plan surrounding this issue, it is completely gender-neutral. Creating partnerships and collaborating on these issues would allow countries like Norway to learn from programs implemented in Indonesia and Colombia. Extremist groups challenge our society and our ideals, while women peacebuilders “weave the fabric of our society,” said Ms. Nika Saeedi, Policy Specialist on Gender, Peacebuilding and Political Processes at UNDP, in doing so, they have been rehabilitating and reintegrating their communities for 20 or 30 years. As we create policy and programs we need to learn from them, she concluded. To this end, UNDP and ICAN have partnered on a research initiative into gendered programs for the disengagement, rehabilitation and reintegration of women and girls who have been affiliated with violent extremist groups. The research will result in a mapping and gendered analysis of existing programs and guidance for practitioners and policymakers that draws on the expertise of civil society. If you are interested in learning more about or contributing to this research initiative, please contact Melinda Holmes at melinda.holmes@icanpeacework.org.